Over time, teeth may fall victim to injuries or decay that cause them to become weak. At Brooks Dental, we focus on both the functional and esthetic demands that your smile requires in order to restore it back to health. Why Choose Brooks Dental for Restorative Dentistry? Digital Impression Technology – No “Goopy” Mouthful! 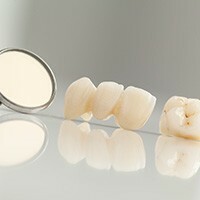 Dental crowns and bridges are high-quality restorations that are designed to replenish the lost structure of natural teeth, whether they have suffered from advanced decay, traumatic injury, or total loss altogether. Our dentists take the time to create precise, custom-made designs for each new smile addition, and metal-free materials are available for confident, aesthetically pleasing results. 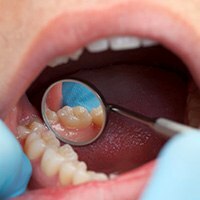 Tooth-colored fillings are now an excellent alternative to the traditional amalgam that so many older patients are very familiar with when it comes to treating cavities. They’re made from composite resin, which comes in a spectrum of enamel-like shades that can be matched to the patient’s natural smile. Additionally, this material can be utilized more conservatively, as it bonds micromechanically to the tooth’s natural structure. At Brooks Dental, we always enjoy being able to provide our patients with convenient and long-lasting care. That is why one-visit restorations are now a reality here in Winthrop with the help of our state-of-the-art 3M Lava Digital Scanner. Our dentists can simplify every stage of the treatment process – from the impressions to the design of the restoration to the finished placement – down to just one appointment in many cases, saving you and your family valuable time. 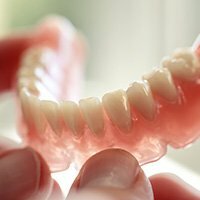 Dentures have been relied on for cost-effective, comprehensive tooth replacement for decades, and today’s prosthetics are sleeker, more comfortable, and more modern-looking than ever before. At Brooks Dental, we provide both traditional full and partial dentures and implant-retained models for superior permanence and oral health benefits. Our goal is to help patients discover the reconstructive service that best fits their unique preferences, goals, and budget.